Our Abpromise guarantee covers the use of ab177601 in the following tested applications. Cleaves collagens of types I, II, and III at one site in the helical domain. Also cleaves collagens of types VII and X. In case of HIV infection, interacts and cleaves the secreted viral Tat protein, leading to a decrease in neuronal Tat's mediated neurotoxicity. There are two distinct domains in this protein; the catalytic N-terminal, and the C-terminal which is involved in substrate specificity and in binding TIMP (tissue inhibitor of metalloproteinases). Undergoes autolytic cleavage to two major forms (22 kDa and 27 kDa). A minor form (25 kDa) is the glycosylated form of the 22 kDa form. The 27 kDa form has no activity while the 22/25 kDa form can act as activator for collagenase. 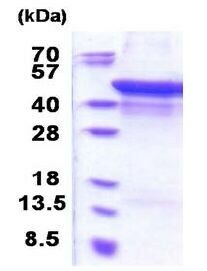 15% SDS-PAGE analysis of ab177601 (3µg). ab177601 has not yet been referenced specifically in any publications. Publishing research using ab177601? Please let us know so that we can cite the reference in this datasheet. There are currently no Customer reviews or Questions for ab177601.